What is the best music production equipment in the market? Gear is our middle name. We live and breathe keeping up on the latest pieces of musical instruments and recording equipment in the market, and today we want to compile a list of all of the best of the best for making music as well as the different types that are out there. If you’re just starting out, don’t feel too overwhelmed! It’s possible to get your setup up and running in no time with a relatively affordable budget. With that being said, and we’ll be quite honest — you’ll need at least some cash saved up; however, it won’t cost you an arm and a leg to get going initially, and many producers nowadays even make a living off of their music from their own homes. You can always grab the essentials now and go back for more later. Let’s get started! 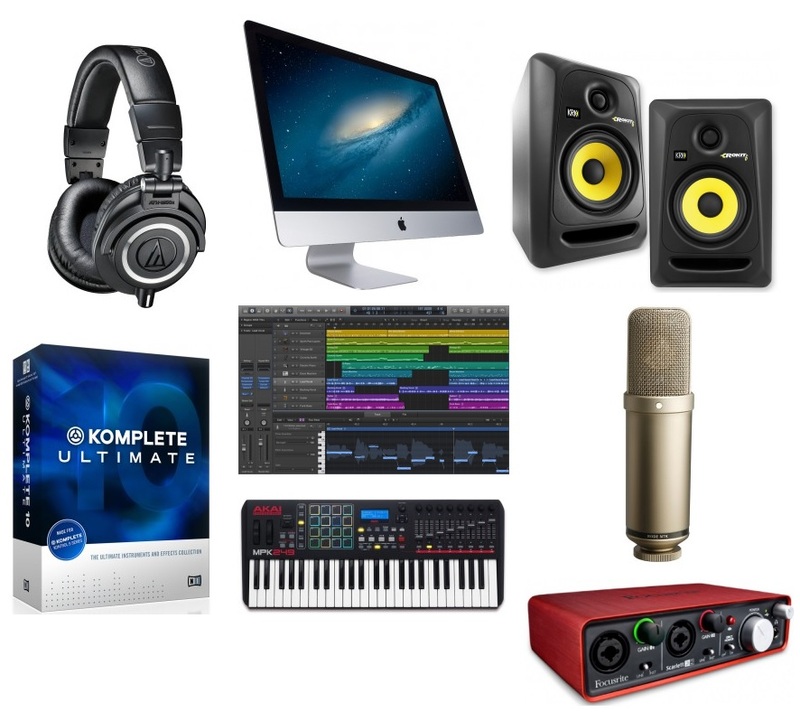 Here’s our list for all of the necessary pieces of equipment needed for an optimal music production setup. 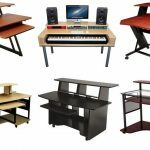 For those who have asked us numerous times on how to build a home studio, this article will cover all of the necessary gear you’ll need to get going. We describe what each is if you’re looking for an explanation and link you to some of our favorite articles as well as our own Top 10’s of each piece of gear if you want to look into further options for that particular item. Scroll down further for our #1 recommend favorites for each piece of gear if you want an exact model to buy. If you’re just starting out and need a guide more tailored to you, our best beginners music equipment may be a little better for you to read. As the list goes down further, keep in mind that the priority of said gear starts to decrease. Technically, you can get away with merely a studio desk, computer and a DAW (#1 and #2) if you’re strictly sampling (something we did for 8+ years!). However, the more you expand your setup, the more capabilities your setup will allow. Recording equipment packages to save some money and time are always a viable option as well, but only for home studios or those just starting out. Computer: Here’s your backbone of the entire production setup. Although rather self-explanatory, which computer you choose is based on a few factors, such as your budget and preference of Mac or PC. If you read our article, there are some necessities in terms of specifications you must keep in mind while shopping. You may also choose to build a production computer from scratch, which will definitely be a bit challenging at first but can ultimately give you more flexibility and save some money at the same time. Of course, we’re assuming you’re planning on having a digital setup (with a majority if studios now being one). If you’re interested, you can try this forum post for building an analog studio. Otherwise, continue on down and we’ll tell you what to hook up to this mother ship. Digital Audio Workstation (DAW): Now that you have your computer, you need a program to actually start making your tunes. Think of your DAW (software) as the canvas for your paint brush(es). There quite a few digital audio workstations in the market to choose from, so be sure to read our top 10 if you want various choices (we think some research should go into this category specifically, because it all depends on your needs). Regardless, any software may ultimately be fine if you’re looking to jot down some tracks. However, if you’re investing in a DAW that will last you a while, we recommend our favorite(s). Studio headphones: Unless you’re planning on using your laptop\computer’s stock speakers (which we do not recommend if you want to be on a higher level), grabbing a pair of studio quality headphones is essential. We’re not talking about those brand names advertised by athletes and ‘rappers’ or anything either — we’re talking studio headphones specifically made for making music, which means models that are made for giving our ears accurate frequencies of our tracks, and of course with high quality material for comfort after long use. This is critical for those producing, mixing, mastering and recording songs — we need accuracy, not a ‘studio headphone’ for people to wear at the gym. Audio interface: What is an audio interface? It may be foreign to some, but to many it’s the key to open the door of a truly optimal setup. Audio interfaces are basically external sound cards that provide not only a decrease in latency from their various controllers but also other facets depending on the model you purchase. Many provide extra USB, XLR and other ports, some with even faster connectivity other than USB (Thunderbolt), as well as an increase in recording quality if you’ll be using it to record a microphone or other instruments. 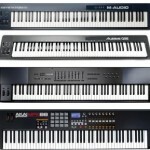 MIDI keyboard: By far the most popular MIDI controller in the market, MIDI keyboards allow you to have a “blank keyboard” that you can assign sounds to via your computer. In order to do so, you’ll need some VST Plug-ins, which we list next. Think of it as your paint brush, the computer as your canvas and the next on our list the colors you’ll be using. If you’re aren’t aware of what they are exactly, these pieces of machinery allow you to have a set of blank keys that play the sound you set up from within your computer. When MIDI first came about, many were skeptical; however, it’s one of the most popular pieces of music equipment in the market today. Some say they can’t do without their MIDI keyboards, while others who only sample say they don’t need it — hence it being at $5. It depends on your needs. VST Plug-ins: These are the paint to your canvas. As previously written, Virtual Studio Technology means just that — the technology of your studio is digital and it comes from your computer alone. There are VST sounds for everything, and what you’re looking for depends on preference: keyboards, drums, FX, strings, choirs, full orchestras, and more. You’d be surprised at how many producers nowadays use VST’s as opposed to real instruments. Some say that the technology has become so advanced, you can’t even tell the difference anymore (although some may argue otherwise, as well!). 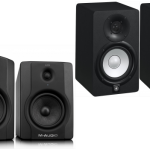 Studio monitor speakers: These are high quality speakers made specifically for the accuracy of frequencies (as opposed to consumer-brand speakers that at times boost the bass\treble to appeal to the larger masses). Some may argue with us for having monitors so low on the list, and for that we welcome the criticism. However, a majority of producers we know and have read about prefer making\producing music with headphones as opposed to speakers. For mixing and mastering on the other hand, we’d definitely recommend monitors. Microphone: We all know what a microphone is, but what about a professional grade model that will give us superior sound quality? To our avail, as technology continues to grow, there are some decent options out there for home and semi-professional studios. 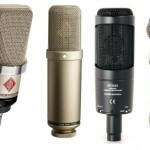 I know some who only prefer thousand dollar microphones, while others use a USB microphone and make amazing music. We won’t give our complete opinion here, however: is there really a noticeable difference in sound quality when you hear the songs? That’s for you to decide. Various other controllers: These aren’t musts at all. However, some may pertain to your interest if it relates to some of your musical goals. You can always come back to these later, but we figured we’d at least include them to show you that there are numerous options when it comes to additional gear you may want to grab\keep in mind for further upgrades when the time comes. We’ll be honest — it’s tough to pick just one piece of gear per category considering there are so many great options to choose from. However, since you’ve scrolled down this far, we want to make it easy for you and give you a solid choice. Here are our current picks for setting up your production studio as soon as possible. We’re still at times torn by our choosing of a Mac for best computer for music production; however, we wanted to keep our bias out of this (we have been PC users all of our lives) and go with the majority (and safe) pick. Mac is the popular opinion among producers. Despite the huge Mac vs. PC debate, this is the safest bet if you are just starting out. Just know that regardless of what you choose, whether it a PC or Mac, you’ll be able to make and record music like everybody else — neither gives you a high advantage, unless of course you take into consideration what we spoke about previously — the DAW you’ll be using. Any controller, pair of headphones, studio monitors or audio interface you purchase will work quite fine with either. 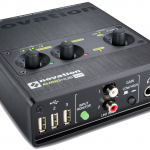 Unless of course, you decide to grab a Thunderbolt audio interface, which is Mac only. 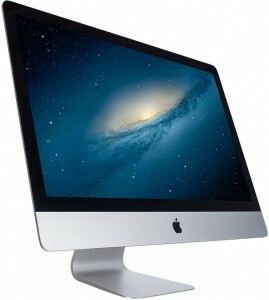 In the end, we’d say an Apple iMac (final answer) due to popular opinion. Considering how many digital audio workstations that are out there (MusicRadar chose 20 of the best DAW), we’re again going with an overall safe and secure pick. This is assuming you went with our choice of Mac previously (since Logic is Mac only). If you’ve gone with PC, our other choice would be Fruity Loops Studio. When it comes to a software for making or recording music, we’re going to be strict here and say to choose wisely. There are some OK pieces of software out there can get the job done that may be a bit cheaper or easier to use; however, this in our opinion (and besides your actual computer) is the most important choice when it comes to long-term investment. You’re going to want a software that will be able to provide you an easy interface learn with as well as something that comes with enough power to handle your wants and needs further down the road (we’re talking a few years as you become better and more accustomed to the software). 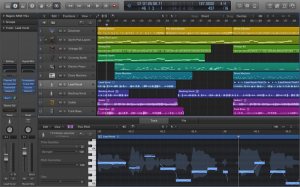 Therefore in our opinion, Logic Pro provides both a learning-friendly interface as well as capabilities that will come in handy later when you’ve got the hang of it. After that and if you’re super serious, start learning Pro Tools. But until then, stick to Logic Pro if you want a sturdy environment to make your music with. The phrase ‘studio’ headphones is quite played out to be honest. However, that doesn’t mean you can’t dig through the rubble of overly advertised ‘headphones’ and to find the pair for you. Communities like the headphone subreddit will quickly show you there is a difference between a Beats by Dre and a nice pair of lesser-known Senny’s. Here’s our choice when it comes to price, quality and comfort, and to be honest we’re wearing a pair of these right now: The ATH-M50x by Audio-Techinca. If you haven’t heard of them yet, perhaps you’re new to the headphone game (which is quite fine); however, we recommend you quickly become aware of their gear. This is by far our favorite and most solid choice of headphones for those looking for a pair of studio headphones that are great for not only producing and recording music but for leisurely use as well. 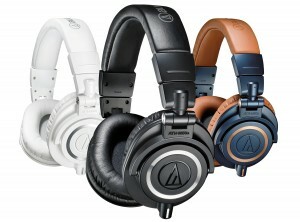 The Audio-Technica ATH-M50x are foldable, collapsible, very comfortable, have interchangeable cables, and of course come with amazing, accurate sound quality. When it came to choosing the best audio interface to recommend our readers, the brand Focusrite immediately came into mind. Now don’t get us wrong, there are some incredibly insane interfaces out there; however, the Scarlett series sticks out as solid when it comes to price to quality ratio. You can grab audio interfaces for as high as $2,000 if you want something insane and have the money. Nevertheless, for those just starting out or many who want the essential capabilities of an interface, this is our top pick. The user reviews outweigh many other models that come within its price range, and the stability as well as longevity of the Focusrite Scarlett make it all the more worth it. As stated previously, MIDI keyboards are sometimes considered one of the most important external pieces of gear besides a computer. This is your blank slate and canvas — as opposed to purchasing an actual synthesizer or popular keyboard that comes with their own sounds many others use, MIDI keyboards are great for those of us who want to save money and consolidate all of their keyboard sounds in one place instead of having racks on racks of numerous synthesizers, keyboards and pianos. As their popularity continues to grow, everybody from M-Audio, Korg, and Native Instruments have their own model — however, today we’re going with Akai Professional’s MPK249. This thing is solid when it comes to stability and build. It isn’t quite the cheapest out there, but as we’ve stated previously, it isn’t always about saving money, especially if you’re investing in a piece of equipment that will be with you for years (our original MIDI keyboard is still going strong after 5 years). The Akai MPK249 comes with 49 solid keys (our recommended count, although there are other options out there), 16 Akai-quality drum pads (they’re known for these if you’ve ever heard of the MPC drum machines), some knobs and faders you can assign FX to, and of course some sounds that come along with the box so you can start playing as soon as you open it. We love this one. You can read our in-depth Akai MPK249 Keyboard review for some more information. This was a tough choice considering Komplete is a relatively expensive one. But hear us out first! We purchased this bundle on a whim when we first started using MIDI (about a few months after buying our first keyboard). Although when we installed it onto our computer and were met with the overwhelmingly amount of sounds at our fingertips, we had no idea where to start. As time went on, the power of this purchase came into perspective — we’re still using it today and have gotten to know it quite well. As we’ve said a few times, cheaper isn’t always better (of course), and in this instance, know that you’re truly investing if you buy it. We’re able to back up this claim after years of using Komplete — not to mention you get a hefty discount if they ever come out with newer versions, which all you need to do is download and you’ve immediately got brand new sounds for you to play with. Pianos, violins, synths (a lot of synths, that sound amazing at that), orchestras, choruses, cellos, drums, FX, you name it, N.I. 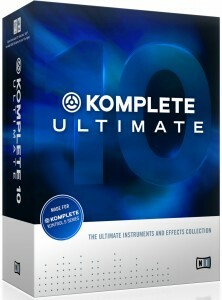 Komplete has it. We’ve provided a video below that demos some of the sounds if you want to take a look. At the end of the day, there are some cheaper and even free VST’s if you want to save some cash and mess around first before dropping a load of cash on some Native Instrument sounds. Check out VST Planet for some free sounds. 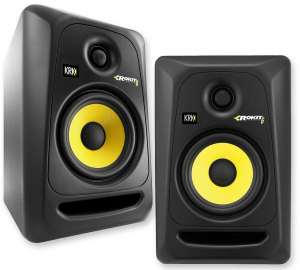 This was a pretty easy choice when it came to choosing the most solid overall pair of studio monitor speakers. We know those who swear by their monitors, even when it comes to producing. In our opinion and experience, we enjoy our studio headphones for producing, but when it comes to getting that mix down or merely listening to music leisurely, it’s time to bust out the studio monitor speakers. There are some relatively affordable choices out there when it comes to monitors (unless you’re a studio snob, you’ll want a thousand dollar pair, but we’re not like that are we?). The entire Rokit series by KRK equipment is worth looking at, but we went with the KRK RP6G3-NA due to the user reviews to give us confidence in the purchase. Keep into consideration you’ll have to buy two separately. 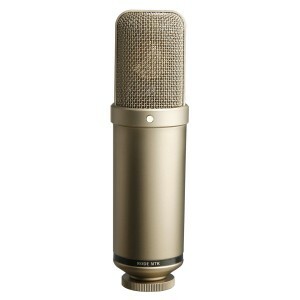 Well, this is definitely a relatively pricey microphone, but after much debate and brainstorming we had to go with a higher price-point when it comes to a mic. A microphone isn’t something you want to sacrifice quality for. You can always check out their Rode NT1-A microphone for a cheaper alternative that still gives you great quality at a more affordable price. Also know that in order to work a condenser microphone, you’ll need some phantom power (an external power source) to make it work properly. However, if you’re purchasing an audio interface (which we recommend if you’re using a mic), that’ll provide the power for you. The Rode NTK is one of the best out there, period. Although we ultimately recommend grabbing a real condenser microphone even if you’re starting out, there are USB mics available that bypass a few steps. If you want a cheaper, more simpler solution that doesn’t require an audio interface, check out our top 10 best USB microphones article. 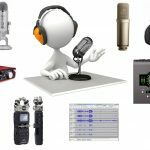 Whether you’re looking for how to build a home studio to record music in, which music production gear is best or merely some information on recording equipment, we hope this article helped you. If there’s any way we can improve this or you don’t agree with our choices for the top models, we are open to every and any type of criticism. We’ll take your opinions into careful consideration as we update this article as new gear comes out. Also feel free to share your music in the comments, we’re always interested in hearing our readers tunes! Good luck and have fun with your creativity endeavors. As previously explained, we made music using only samples (with a computer and headphones of course) for nearly 8 years until we bought our first MIDI keyboard, audio interface, and microphone. Nowadays with technological advancements, it’s not about the gear, but the musician. There’s always time to save money to upgrade your setup later on, so if you want to get going easily and already have a computer and pair of headphones, grabbing a MIDI keyboard and some sounds for the time being may be all you need. On the other hand, some may want to start singing or rapping and need a microphone and audio interface. It all depends on your needs.